1995 Nobel Prize Laureate for Literature. In Ireland they affectionately called him Famous Seamus – Seamus Heaney (1939 – 2013). And now he has gone. Too soon. This Irish poet, translator and essayist, so well-known around the world, has died. At age 74. The internet was abuzz yesterday with his going from us, so unexpectedly. Obituaries abound. Blogs on his death abound. Click here for a particularly personal one which was sent to me by my friend Sheila. All these stories tell in great detail the breadth and achievements of his life. He was born in Northern Ireland. Published his first book of poems Death of a Naturalist in 1996; moved in 1970 with his family to the Irish Republic when the so-called “Troubles”, the sectarian violence in Northern Ireland became more than he could bear; won the Nobel Prize in Literature in 1995. He is a poet, who, I imagine, will stand the test of time. Who will be recognized, truly, as one of the finest English-speaking poets of his time or any other. But today I feel bereft by his loss. It’s too soon. His letting go. The letting go he so metaphorically and unexpectedly described in his poem the Human Chain from his book of the same title published in 2010. Or it will once. And, for all. So many Heaney trademarks in this poem. The descriptive but simple language (casual and modern), the use of Irish colloquialisms (lugs or handles), easy musical cadences and so much action going on! And the under-stated surprises. This starts off like a lovely rural scene and then we are dropped into what seems like a war zone and then focused back with a narrow depth of field to the action again as if everything was normal. But the power of this poem for me is how he gives us the gorgeous and intricate description of throwing heavy bags, even down to the smallest detail of moving the grain at the corners to make handles (lugs) and then somehow how he translates all that physicality and motion, made so musical, into a huge thought about death. And he makes it even more unexpected by making that translation or leap part of a contradiction. something Vendler describes, in general, as his second thoughts. A letting go that will not come again./ Or it will once. And for all. Listen to that play on words. By breaking the last sentence into two parts we receive a wonderful echo of the hackneyed expression, once and for all, while at the same time giving us this leap into a big thought on death. A deft double play, double meaning. The letting go of the those heavy bags become the letting go of our own heavy bodies at death. And in wonderful way this poem, in his twelfth and last book, becomes his epitaph: There was a once more. A final letting go. But now, truly, for him. His death yesterday in Dublin. This poem holds so true in all its aspects to an Ars Poetica he wrote early in his writing career which he describes as Lines to myself. Like a saw zooming in seasoned wood. Helen Vendler, the celebrated American academic and literary critic, who is acknowledged by many as an outstanding authority on poetry, discovered Heaney at a summer-school poetry reading in Ireland in 1975. She says Heaney stood at the lectern and read some of the most extraordinary poems I had ever heard. After the reading, Vendler asked Heaney if the poems would be appearing soon in a book and he said yes, that he had the galleys with him. They were the galleys of his book North which, in her 1998 book on Heaney and his poetry titled Seamus Heaney, she calls one of the crucial poetic interventions of the twentieth century, ranking with Prufrock [T.S. Eliot] and Harmonium [Wallace Stevens] and North of Boston [Robert Frost] in its key role in the history of modern poetry. His poem Postscript, which introduces this post, embodies this isness. We are there with him on the road speeding by the ocean on one side and a lake on the other, a lake with its swans, very reminiscent of W.B. Yeat’s The Wild Swans at Coole. We experience with him the event of seeing all of this and without stopping for a closer look suddenly we, who are invited on this wild ride, are buffeted and our hearts blown open. Our hearts are blown open in the poem. But what about in my life outside this poem. Is my heart seeing deeply enough to be blown open? If not, this poem asks me indirectly, why not? When I think of poems of Heaney’s that have stayed with me, haunted me it is because they do what he believes poems are meant to do. To cause the reader to say: Yes, I know something like that too. Yes, that’s right; thank you for putting words on it and making it more or less official. For me, in particular, he does this in his remarkable sequence of sonnets dedicated to his mother and titled Clearances. 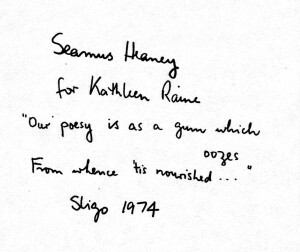 I can’t conclude this memorial blog for Heaney without including his signature poem – Digging. It is the first poem in his first book. He wrote it in 1964. He describes it in his essay Feeling Into Words as an example of poems he has written that give me any right to speak: poetry as divination, poetry as revelation of the self to the self, as restoration of culture to itself… He says this poem was the first I wrote where I thought my feelings had got into words, or to put it more accurately, where I thought my feel had got into words. Than any other man in Toner’s bog. Oh My. And how he dug with it! Again what an isness in this scene. I, a reader, am there with him. But as in most of his poems there are so many layers in this poem – not just layers of peat. Vendler points out the critical importance of the second line – how it places Heaney in the context of the violent Ireland he grew up in and the choices he made to how to respond to it. Between my finger and my thumb/ the squat pen rests; snug as a gun. Vendler says: This is to conceive of writing as, like war, politics by other means. 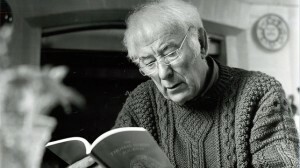 It is significant that in this – the first poem in his first book – Heaney regrets the concept of writing as aggression and chooses the spade as he final analogue for the pen: the pen will serve as an instrument of exploration and excavation, yielding warmth (like his Grandfather’s turf for fires) and nourishment (like his father’s potatoes). Here is the great paradox of poetry and of the imaginative arts in general. Faced with the brutality of the historical onslaught, they are practically useless. Yet they verify our singularity, they strike and stake out the ore of self which lies at the base of every individuated life. In one sense the efficacy of poetry is nil – no lyric has ever stopped a tank. In another sense it is unlimited.It is like writing in the sand in the face of which accusers and accused are left speechless and renewed. Heaney continues: The drawing of those characters is like poetry, a break with the usual life but not an absconding from it. 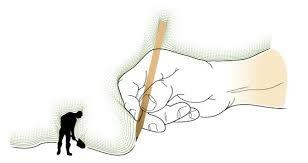 Poetry, like the writing, is arbitrary and marks time in every possible sense of that phrase. It does not say to the accusing crowd or to the helpless accused, ‘Now a solution will take place’, it does not propose to be instrumental or effective. Instead, in the rift between what is going to happen and whatever we would wish to happen, poetry holds attention for a space, functions not as a distraction but as pure concentration, a focus where our our power to concentrate is concentrated back on ourselves. To end I will leave a last word to Heaney. His delightful small poem about writing poetry. The first stanza is a msyterious lyric. Hard to fathom easily. And that seems to be the point. Some times a poem will stay mysterious. And Heaney ends with his arch poetic declaration. One I have heard other poets give as a description of a lyric poem – that it should start in the middle and end in the middle. ‘Bright guarantee of God, and the waves went quiet. I could see headlands and buffeted cliffs. This entry was written by Richard Osler, posted on August 31, 2013 at 10:39 pm, filed under General and tagged Clearances, Digging, Helen Vendler, Open Ground - Poems 1966 - 1996, Postscript, Seamus Heaney, The Human Chain, The Wild Swans at Coole, W.B. Yeats. Bookmark the permalink. Follow any comments here with the RSS feed for this post. 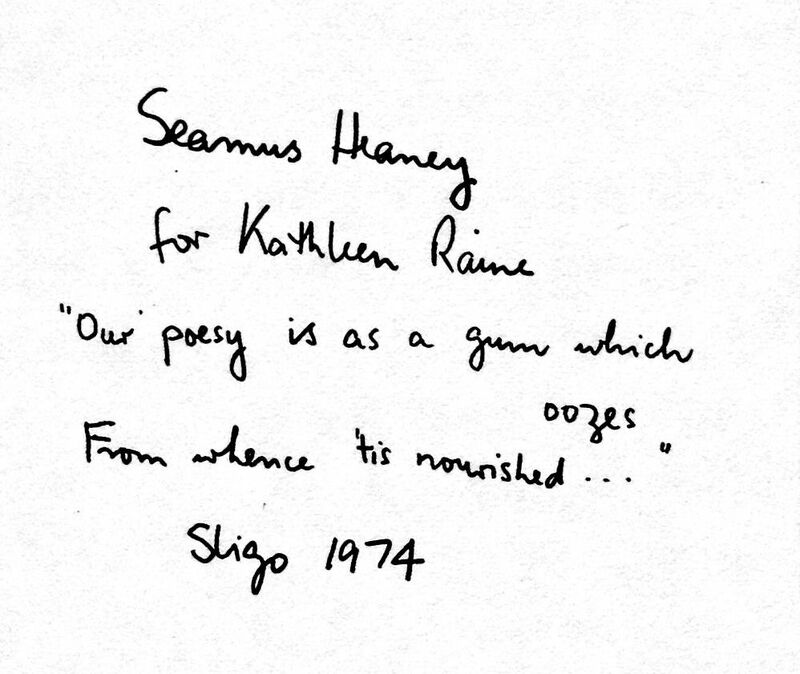 Thanks for this wonderful acknowledgment and interpretation of Seamus Heaney’s poetic contribution, Richard. I learned a lot from reading this! Dear Donnie: Appreciate the hello across the divided ether! I am haunted by Heaney’s passing in ways I never expected. I have a stack of his books, many autographed by him, but I had never dunked myself in his words as I have in the past 48 hours. A sad reason but a huge enjoyment. Will post more on him in the coming days! Barbara: Love your lines! Went back to that poem Sunlight. Still mysterious as hell to me! Read an analysis for students but it doesn’t take the shine of the strangeness for me. So many conflicting images of beauty and hardship. ANd the last stanza. I don’t want to understand it. Just marvel at it. ANd here is love/like a tinsmith’s scoop/sunk past its gleam/in the meal bin. Is her love (the scoop) part of a bigger love (her family? )Does she give away her love from that bigger source that feeds her first? This makes me think of Jane Kenyon’s poem Let Evening Come. I admire how he places the quotidian within an almost spiritual concreteness, if that even makes sense. All these domestic actions are part of simple Being, and yet, he seems to suggest, this part of life should never be overlooked. The poem is written in a pace that leads the reader through these tasks, as if we are part of both the enactment and the devotion of the observing narrator. In this sense, I agree. It IS reminiscent of Jane Kenyon’s poem. Thank you again Richard, for your wonderful post.